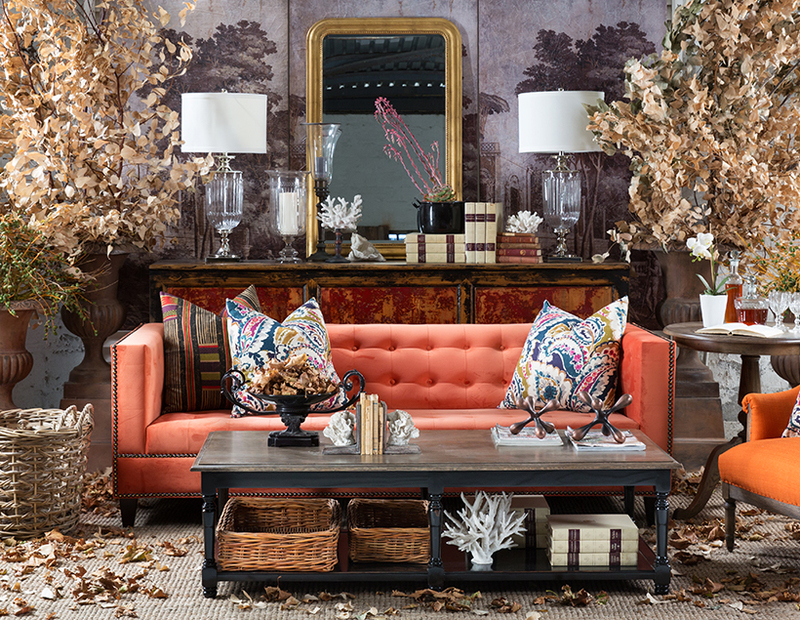 Bring the rich colours of autumn into your decor and give your home the rustic charm of the season that we all love. Change has never been more beautiful than it is when summer’s many greens start transitioning to oranges, yellows, reds and browns. Along with this comes chillier evenings that call for time spent enjoying the warmth of our homes. If there’s one thing that’s distinctive about autumn, it’s the season's vibrant colour palette. So, consider incorporating burnt orange, deep brown, ochre, fiery red and deep forest green. Go for natural textures such as sisal, wood and rattan as these will help warm up a room, while evoking images of the bare branches associated with the season. Another idea is to go for distressed wood or paint finishes for an "end of summer" feel. Image source left and right. Try our made-to-order sofa collection that comes in a variety of styles and sizes with a selection of 18 rich shades and textures, including natural tones in linen and vivid colours, including red, orange and yellow, in velvet. In fact, velvet is a beautiful, warm texture for autumn and aligns well with the associated richness of the season. In your lounge or TV room, use a woven rattan basket to store throws and blankets that you can snuggle into when it gets chilly. Alternatively, stack a few folded blankets on a stool such as the Jimlou stool, so they're easily within reach for when you need an extra layer, whilst adding to the room's aesthetic. Create a wreathe made out of vine twigs to use as a table centrepiece around candles, or to hang as decoration. View the video below for inspiration. Alternatively, collect oak or poplar branches with multi-coloured autumn leaves still attached and arrange these in a vase. To complete your look, consider what accessories you have on various table surfaces. Swap out any silver accessories for warmer metallics, like this Pablo tear drop sculpture and the Edward table clock with a dark face and gold detail. Give your home decor a touch of warmth for the changing season and you'll have every excuse to stay in.